It’s Hexa-coordinate carbon Spock – but not as we know it! In the previous two posts, I noted the recent suggestion of how a stable frozen SN2 transition state might be made. This is characterised by a central carbon with five coordinated ligands. 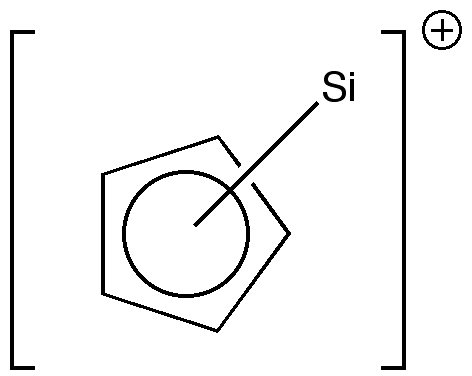 The original suggestion included two astatine atoms as ligands (X=At), but in my post I suggested an alternative which would have five carbon ligands instead (X=cyclopentadienyl anion). However, these five ligands are not all equal; far from it. 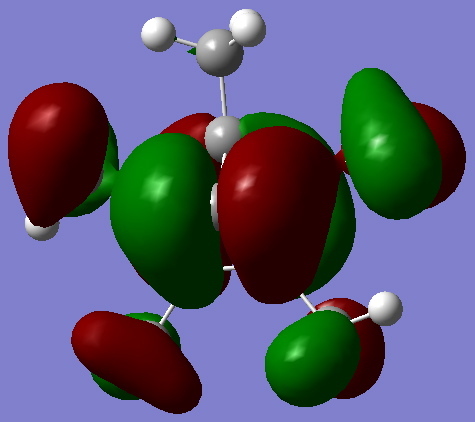 Three form normal strength bonds to the central carbon, and two very weak (deci)bonds. So, could a molecule be made with five equal bonds all coordinated to a central carbon atom? Well, the inspiration for designing such a molecule comes with the report of a remarkable compound of silicon by Jutzi and co-workers. Examples with Ge, Sn and Pb are also known. So, not only do we now have a clearly penta-coordinate carbon, all five bonds are of equal length! 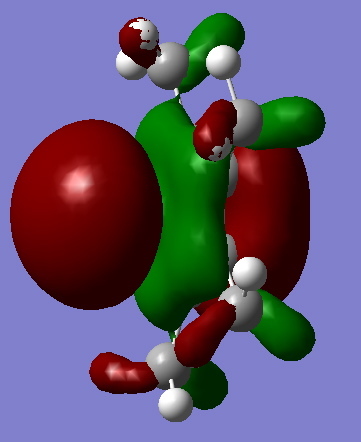 More unusual still, all five ligands occupy one hemisphere of the carbon coordination. Why might such a geometry be stable? Well, as with the silicon analogue, C2+ has only two valence electrons left. To elevate this to the standard octet, it must accept six electrons, and the cyclopentadienyl anion fulfils this role perfectly. 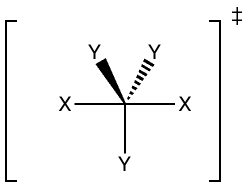 The top three occupied molecular orbitals are shown below. 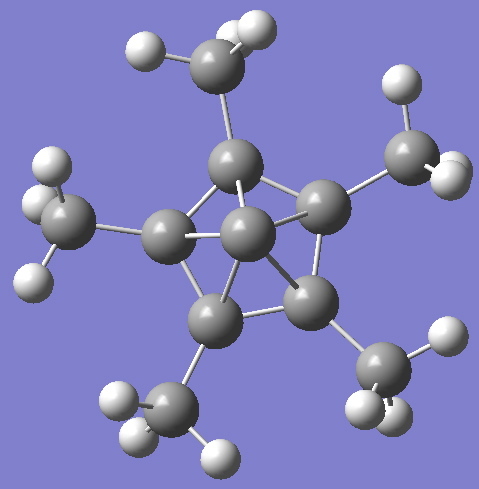 An AIM analysis (below) shows five equal bond critical points, with ρ(r) 0.13 au for each (see previous post for comparison), a value which probably can be described by the term bond. The ∇2ρ value of +0.07 au is similar to that quoted in the previous post. 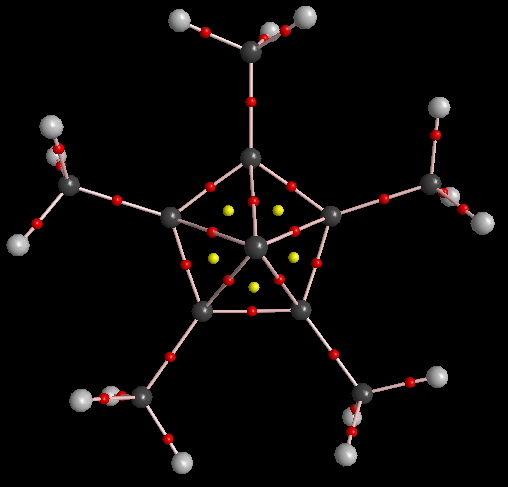 Noteworthy is the observation that no ring critical point (RCP, yellow dots) can be found for the cyclopentadienyl ring itself, only for the five three-membered rings to the pentacoordinate atom. Can the species be made? Well, given that it seems the case that carbon and silicon chemistries are inverted, ie what is stable with silicon is unstable with carbon, and vice versa, the answer is probably no. But one never knows until one has tried! This entry was posted on Wednesday, September 30th, 2009 at 6:01 pm and is filed under Hypervalency, Interesting chemistry. You can follow any responses to this entry through the RSS 2.0 feed. You can leave a response, or trackback from your own site. These last three posts have been very provocative, and I’ve been silent in response mainly because I have been playing with a variety of ideas inspired buy these comments. Unfortunately, I’ve been unsuccessful in all my attempts to find additional representatives of the hypercoordinate carbon! So Bravo to Henry for locating these interesting structures! How close does this get to the type of bonding we see in carboranes? This almost looks to me like an all-carbon model of what boron does all the time in higher boranes. If that is the case carbyliumylidene (what a mouthful) could conceivably be stable. Ut would be worth identifying an analogue containing boron and comparing the two. Suggestions welcome. PS: I have identified CH12B11– as a reasonably close analogue. I will report a bonding analysis in a separate post. It’s penta-coordinate carbon Spock- but not as we know it! is licensed by Henry Rzepa under a Creative Commons Attribution-Noncommercial-Share Alike 3.0 United States License.